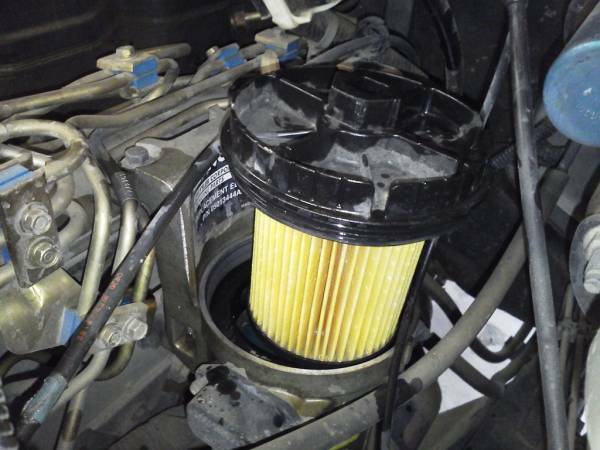 Ready to change the fuel filter on your 24V Cummins Diesel? Well, you'll find fewer vehicles that are as easy to perform this on than the Dodge Ram 2500/3500 truck. With a ratchet and extension, you can have the old filter out, snap the new filter in place and reinstall in less than 5 minutes....making this an easy-to-do roadside repair. Combine the ease of change with the low price of a replacement filter (<$15) and you have a maintenance procedure that should implemented more often than not. Scheduled maintenance, sluggish performance, poor fuel economy, no-start condition, rough idle, and known bad fuel. 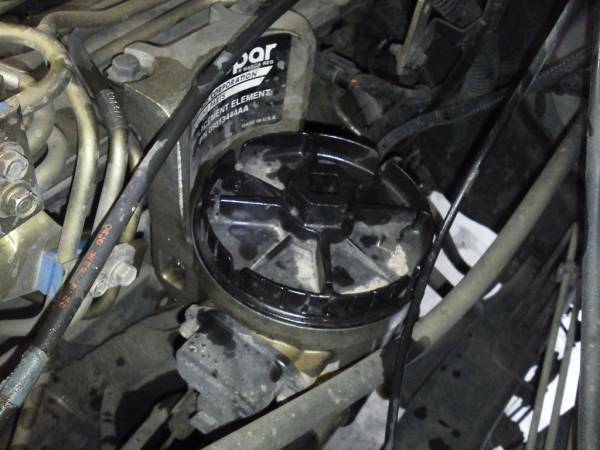 Pop the hood of the truck and locate the fuel filter housing on the driver's side of the engine, near the firewall. Fit a 1/2" drive extension into the square receptacle atop the fuel filter lid. Using a 1/2" ratchet, loosen the lid (may be tight at first) until upward removal of the filter element/lid is possible. Note - a 1-1/8" (29mm) socket may be used on the lid as well if use of the square drive is not possible or desired. 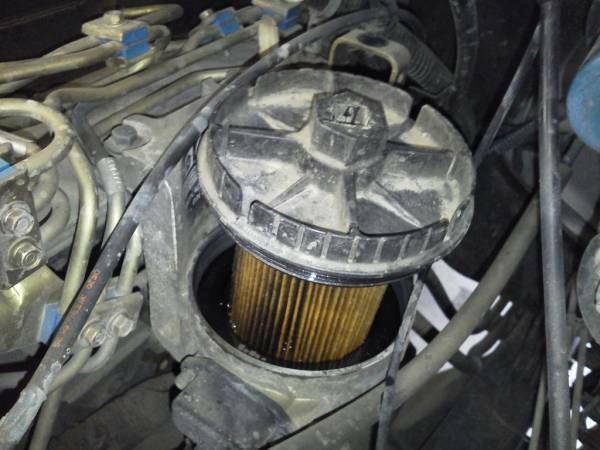 Careful to avoid any cables, lift the filter element/lid upward and tilt 45 degrees to allow all possible fuel to drain back into the filter housing. Keeping as much fuel in the housing will ensure air doesn't enter the fuel lines or lift pump. 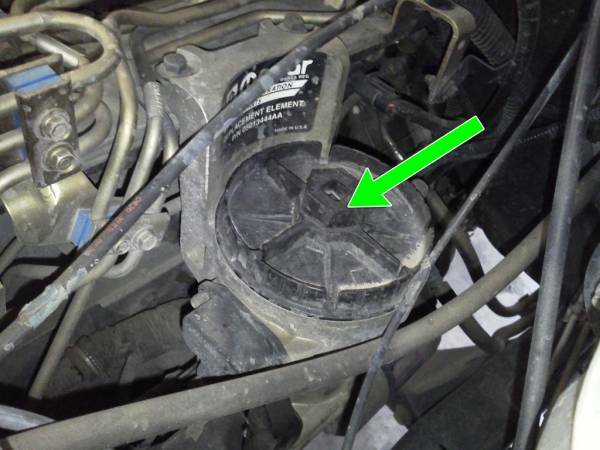 Air trapped in the lift pump can be difficult to remove and may reduce performance. With the filter element/lid removed from the truck, invert the assembly and note the 8 retaining tabs holding the element in place. Remove the element (work your way around the tabs in one direction and "walk" the element out) by gently prying the tabs outward and lifting the element. Also use this time to remove the old o-ring from the lid. 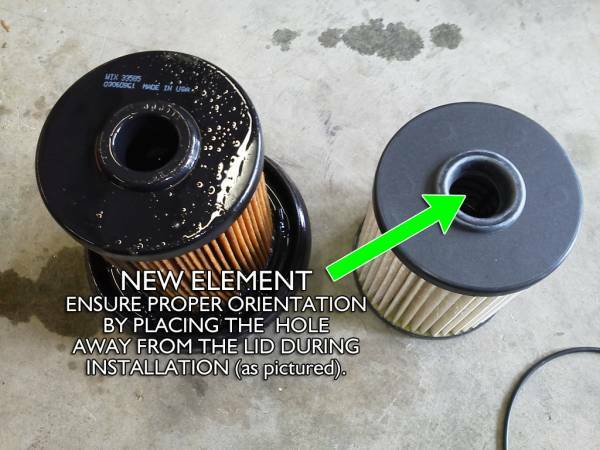 Ensuring the new filter is correctly oriented (the hole should be pointing away from the lid), snap the new element in place and install the new o-ring. Insert the new filter element slowly into the filter housing, ensuring not to splash any fuel out or introduce any trapped air into the system. Tighten the lid into place, torquing it to 25 ft-lbs or simply snug it up. Remember that it is plastic and will break or deform if over-tightened. New filter should be installed. Without cranking the engine, cycle the ignition on/off 2-3 times to allow the pump to properly pressurize the system and remove any air that may have been introduced. The first time you start the truck after fuel replacement, it may require a little longer crank time and may idle odd for the first 5-10 seconds. If the engine will not crank or continues to idle erratically, ensure that the filter is properly tightened, that the o-ring was installed properly, and that there is no air introduced into the system. 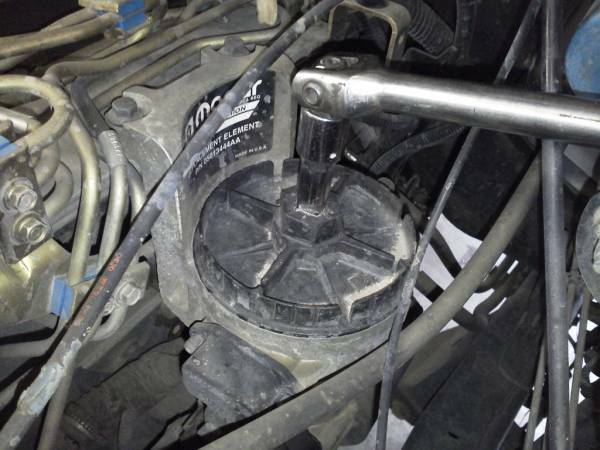 Repeat the no-crank ignition cycle a few more times to allow the lift pump to purge air.